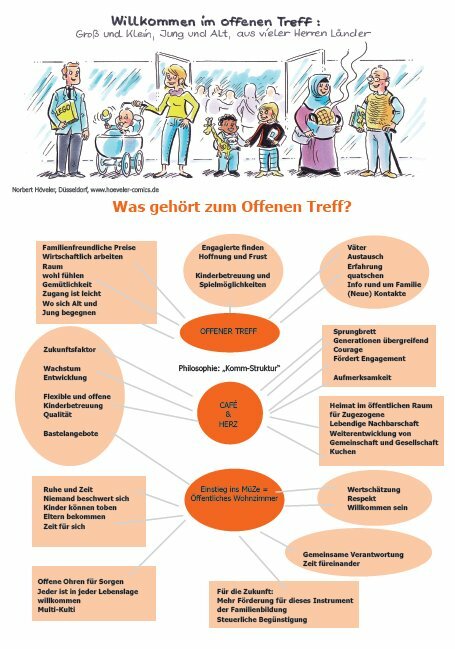 Open Parent Café – Familienzentrum Klara e. V.
For adults of all ages, with or without children. Are you looking for encounters, your child/grandchild, as well? Are you new in Freiburg? A break at work does not mean a break in your brain? Who are actually your neighbors? Your first baby is born or are you the only one in your circle of friends with a toddler? Great, but how do other parents manage to take a shower and be ready by 10 a.m.? Sleeping at night – dream on? Grandma and grandpa are too far away? Sometimes it would be nice to hear children and young people talk and laugh, for a change? Do you have lots of time and would like to share it with younger generations? Which songs and nursery rhymes do kids actually sing nowadays? Keep on being curious – and drop by! Thursdays, 9:30 a.m. – 11:30 a.m. The Open Café on Tuesdays afternoon takes place during summer on the Rumpelhausen Adventure Playground, Ferdinand-Weiß-Straße 1 (at the junction with Klarastraße). Daily updated information regarding the location is available on our Facebook page. Some of our members actively take care of the playground in the framework of our cooperation with Rumpelhausen, for instance during special maintenance days.